If you are interested in hearing us talk or playing one of our copyright games we have included details of upcoming and previous events, conferences and presentations we are giving / have given on this page. If you are interested in reading more about our research, see our Publications. Jane and Chris will be presenting at the Talis Insight Europe conference on 1st May in Birmingham. 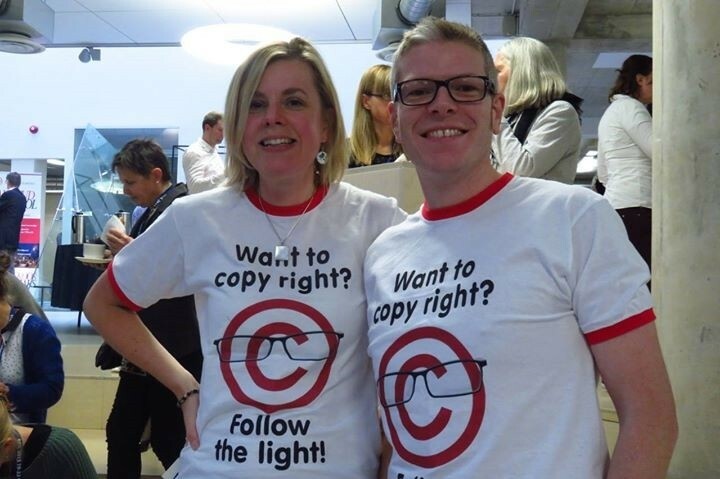 Jane and Chris will be presenting at the CILIP Copyright Conference on 2nd April in London. Jane and Chris will be running a workshop at the National Acquisitions Group Seminar at the Studio, Leeds on 7th November. Jane and Chris will be presenting at CopyCamp from the 5-6th October at the National Film Archive in Warsaw, Poland. Jane will be visiting professor at the Universidad de la República in Montevideo Uruguay, teaching a course on copyright literacy and presenting a keynote at a conference. You can find out more about this trip in the related blog post. Jane and Chris presented at the RepoFringe conference at the Royal Society of Edinburgh on 2nd and 3rd July 2018. Our slides are online. Jane presented at the German Library Association conference / Bibliothekartag 107 in Berlin on 14th June 2018. Chris and Jane presented at the DARTS conference on 24-25th May 2018 at Dartington Hall, Devon. Jane will ran a workshop at the 26th EBLIDA Annual Council Meeting & EBLIDA-NAPLE Conference is “Libraries bridging borders”in Strasbourg on 30-31st May 2018. Jane and Chris ran an Introduction to Copyright and Copyright Education for NoWAL (North West Academic Libraries) on 6th March 2018 at Salford University. Jane ran a CPD25 Copyright the Card Game workshop on 13th February 2018. Chris and Jane chaired the CPD25 event on copyright support for teaching and research on 26th February 2018. Jane and Chris gave a talk at the Learning on Screen AGM on 1st December in London. Jane and Chris ran a workshop based on Copyright the Card Game at London Info International on the 5th and 6th December in London. Jane ran a workshop about creative approaches to copyright education at the I2C2 Conference in Scarborough from 13th-15th November 2017. Jane presented a paper and chaired a panel discussion on copyright literacy at the European Conference on Information Literacy (ECIL2017) in St Malo, France from 18-21st September 2017. Jane and Chris were part of an international panel opening the IFLA off-site meeting on Models of Copyright Education in Information Literacy Programs on 23rd August 2017 in Wroclaw, Poland. Jane and Chris presented a workshop and launched v2.0 of Copyright the Card Game at the CILIP Conference in Manchester on 5th July 2017. The slides and resources are available on this website. Chris and Jane presented a joint keynote at CILIP Scotland conference on 6th June 2017 entitled the Road to Copyright Literacy. The slides are available on Slideshare. Jane delivered a keynote at the CILIP Wales conference in Llandudno on 12th May. Jane presented at OER17 on our research into copyright and IPR issues related to lecture recording on 5th April in London. Chris and Jane presented at the CILIP Copyright Conference on their research into librarians’ experiences of copyright on 7th April in London. Chris and Jane will be presenting at LILAC 2017 in Swansea from 10-12th April on their research into librarians’ experiences of copyright and running a workshop on creative approaches to copyright education. Jane presented a Lightning Talk at ACRL2017 in Baltimore, Maryland, USA on Librarians’ Experience of Copyright in their Professional lives on 24th March. The slides are available online. Jane ran a Copyright the Card game workshop with Monique Ritchie at a CPD25 event on 28th February in London. Chris and Jane ran a workshop on ‘copyright, ethics and openness’ as part of the Open Knowledge in Higher Education module, run at the University of Manchester on 17th February. The resources are available online. Chris presented at the Learning on Screen AGM on 2nd December 2016 on lecture recording and copyright issues. Jane and Chris presented at the final Heron User Group meeting on 13th December 2016 on lecture recording and copyright issues. Jane and Chris will be running a demonstration of their prototype game, The Publishing Trap at the ALT Games based learning SIG event on 17th November 2016. Chris presented a Library Connect webinar on Copyright the Card Game on 13th October 2016. Jane presented at ECIL 2016 on copyright literacy and the findings from a phenomenographic study of librarians. See the slides from this event. We presented at ALT-C on 7th September 2016 on copyright issues and lecture recording. Jane gave a keynote, entitled copyright and e-learning: understanding our privileges and freedoms. Watch a recording of this event. Chris ran two workshops at the National Acquisitions Group conference in Glasgow on 14th-15th September. We presented at the LIS-Copyseek Copyright Colloquium on 20th July 2016, held at the University of Greenwich, discussing the new CLA HE licence and findings from the copyright and lecture capture survey. We presented at the Dublin Institute of Technology E-learning Summer School. We spoke about our new book and ran a workshop to play Copyright the Card Game. Jane and Chris presented at the International Library and Information Group Copyright event on 31st May 2016. Jane and Chris presented at the 2016 CILIP Copyright Briefing on 7th April 2016. Jane and Chris presented at LILAC 2016 in Dublin from 21-23 March 2016. Copyright Literacy in the UK: understanding library and information professionals. Slides available online. Morrison, C and Secker J. (2015) Copyright education in the age of social media. Workshop at Social Media for Learning in Higher Education Conference. Sheffield Hallam University. 18th December 2015. Slides available on Slideshare. Copyright the Card Game workshop at CILIP Information Literacy Group event Information Literacy, games and play. Shine, Leeds. 23rd November 2015. Secker, J and Morrison, C. Copyright Literacy in the UK: Results from a Survey of Library and Information Professionals. European Conference on Information Literacy, 19-23 October 2015, Tallinn, Estonia. Slides available on Slideshare. University of Cambridge, Copyright the Card Game training session for librarians. 28th September. Secker, J and Morrison, C. Copyright Literacy Review. Paper presented at the 11th Northumbria Conference on Performance Management in Libraries and Information Services, Edinburgh. 19 July 2015. Slides available on Slideshare.